Yes. Perhaps, the Workers’ Party is right. Perhaps, JBJ was right when he opposed the Elected President proposal. The power of checks and balances should go back to the Parliament and there is no point of continued debating the role of the Elected President. The more debates on the role of EP, the more political the post of EP will be. The New Parliament will be sitting in October. The PAP government should seriously consider abolishing the EP and go back to the original ceremonial role of the President. Both the government and President Tony Tan have hinted that there will be some changes as regards to the role of the EP. Why don’t take this opportunity to abolish the EP and return the power of the EP back to the Parliament? We only know the good points of the PAP government, for example economic growth and in fact, they have made policy mistakes too. EP was one of them that not only it has failed to unite the people but divide the people further. EP is created to protect the country’s reserve and institutions just in case a bad government is elected. Who is to decide the definition of bad government that will never listen to the voice of the people? Is it the PAP or the voters? Obviously, the voters are responsible not the PAP. A PAP endorsed President who only received 35% of the votes will have a hard time to unify the people if not divided them further. Singapore voters have become more mature than before as shown in GE2011 and PE2011. Because of the maturity, the outdated EP is no more suitable for today’s Singapore. The EP was designed for some special reasons more than 20 years ago and the reasons are no more valid today. Any alterations, changes and refining will still make EP a political one for political purpose. Can we deny that all candidates in PE2011 have no political agenda? Have any of them received no support from political parties? It is said to be non-partisan and neutral. But without party machinery, no candidate can win the Presidential Election. Tan Kin Lian was the weakest link so he lost his deposit. It is created in favour of a government endorsed candidate but it is now back firing itself. Voters blamed the PAP supported candidate for all the wrong doings of the PAP. A non-politician has little chance to be elected too. He has no power base like Tony Tan and Tan Cheng Bock in the north and west of Singapore respectively. How can an EP have his own power base in a particular area in Singapore? And he supposes to serve the whole country. It divides the country further. Consistently, in future, whoever wins the race will have to have a power base. This will make the contest even more politically. It also denies minority to be an EP in future. This is a very bad development for our multi-racial society. Past examples had shown that a non Chinese can serve as a unifying President, a People President! The EP cannot safeguard the reserve as long as the government has two-third majority in the Parliament. If a President elected by Singapore voters cannot exercise his rights to protect the reserve, and then what is the point of electing him? If he exercises his rights, he is considered as the second power centre. The government can even remove him from office. So, a contested EP has no power but indeed divides the country, divides the people further. It is better to take away the ‘E’ from EP and return to its original ceremonial role. I voted with my heart and has no regret even Jee Say did not win the race. In Singapore, we really need people like Jee Say and Kin Lian to act differently from the main stream and provide alternative ideas and views. Hence, biodiversity of ideas and views is the measurement of the health of our politics and society. If there is no biodiversity in our society, in Singapore, sooner or later we will be extinct because we will be too homogeneous and lack of anti-body mechanism. However, political diversity under the government propaganda has always become a bad word, likes confrontational, anti-unity, and of course, anti-establishment. If not because of Jee Say and Kin Lian, voters will not be aware (and concern) of moral, value, and responsibility. Their contributions in PE2011 have helped to push the pro-PAP voters towards the central; this is why Cheng Bock is getting so many votes, a surprise not only to himself and also to the PAP. However, I am always uncomfortable with Cheng Bock even he is the second best and only lost by 0.3%. This is because some academics have suggested that the PAP had in fact achieved 70% of the total votes when the two Dr Tans combined their votes in this PE. If this is true, then we have to re-examine whether the 65% voted against Dr Tony Tan is a real discontent of the people. No wonder, Dr Tony Tan said the vote was decisive. If this is true, how independence can Cheng Bock be? So, voters were voting two whites, one is pure white and the other is not so pure. The PAP is testing the market with a new right to central product – Cheng Bock. It seems they have achieved their aim. Voters like and prefer this new product and in the next election, more Cheng Bock type of PAP candidates will appear. And they will recruit more ‘independent’ minded candidates rather than pro-establishment candidates in the next GE. I feel sorry for Jee Say. Being a Mohism (Mozi) type of person, he would have to do more sacrifices for Singapore. He may not even be elected as an MP in the next GE because of his negative image published in the main stream media. Bad name a candidate is always a strategy for the PAP. They have systematically been doing so since independence. JBJ, Francis Seow, Chee Soon Juan, Tang Liang Hong, and now Tan Jee Say. Besides JBJ, have any one of them being elected before? It will be hard for Jee Say to change his ‘bad’ name to ‘good’ name under the present circumstances. As Jee Say said one of the reasons that he failed in PE2011 was he could not reach out to the old voters. I have mentioned in my post on the non-English speaking voters as king makers in this PE. I believe most of Dr Tony Tan’s votes are from this group of voters (who should also include new citizens). And those English speaking, better educated PAP supporters were supporting Cheng Bock. When the PAP realises the non-English speaking voters are declining, they quickly replace the drop by increasing the number of new citizens. Therefore, they can continue to maintain 35% of die-hard supporters. However, for Jee Say, it will be very hard to get 50.1% in a one-to-one parliament contest. The other 25% moderate pro-PAP supporters will not vote for him. In addition, there is another 10% pro-opposition voters will not choose Jee Say even he tries to change his image. Quite sad but this is a political reality in Singapore. Perhaps, Jee Say is ahead of his time in political idealism in Singapore. This has to take time, may be after 2 or 3 more GEs later, then Singapore voters can accept Jee Say. Otherwise, to change the mindset of people in Singapore, some big changes in the PAP something like the Jasmine revolution will need to take place. As far as Jee Say is happy with what he is doing even being projected as a confrontational figure and face with unfair treatment in the main stream media, he should continue to pursue his cause as there are a quarter of population supporting him. Good luck for Jee Say and Kin Lian. Thank you we know you have already tried your best. 2011 is a wonderful year for Singapore politics. It has kicked out the dirty word of walkover and finally voters in Tanjong Pagar have the chance to cast their votes today. Full contest is common and walkover is unusual. This is the norm. However, this is not the case for Singapore. Since independence, the PAP government has been very proud of the walkover achievement. In almost all the past elections before 2011, they have laughed at the oppositions not being able to produce quality candidates to contest all the parliament seats, as well as securing the certificate of eligibility for Presidential Election. It will be hard to imagine there will be walkover in any future election, GE or PE. And to win the election, more qualified candidates have to step forward, either from the pro- or anti-establishment camp. It is a very good sign for Singapore democracy which has become more matured, responsive and participated. It now involves the whole voting population. If there is an election, there is a hope. More candidates are willing to stand in elections despite of some unfavourable election rules and systems, like GRC, COE, NTUC, boundary changes, PA, RC, CCC etc. Even the system may not be fair to all, but this year GE and PE have proved that there is chance for non-establishment candidates to win. Yes, there is a possibility to win against the establishment candidates. The breakthrough in a GRC for Workers’ Party and getting a COE for Presidential Election are major achievements for Singapore, not only for the oppositions. Congratulation Singapore, we are back to normal. Congratulation to Singapore voters who have finally realised they have the right to vote and vote for some one they like. We have entered the politics of diversification but not necessary a divided country. Only the PAP that is used to monopoly will think diversification is bad for the country. Let respect the decisions of the voters. A divided Singapore is looking for a unifying heart and voice as President. When we enter the polling stations on 27 August, one thing for sure is we are NOT electing the government which has already been formed in May. In fact, it is a strong government controlling 81 out of the 87 seats in the Parliament. The result of the Presidential election will NOT collapse the government. On the contrary, the Parliament can overthrow the veto decision of the President with two-third majority. There is no danger of a weak government or an ineffective government. Hence, Dr Tony Tan believes that with the right leadership, there's no need for Singaporeans to fear the future. Indeed, the government is too strong, for example, the recently case of Aljuned GRC, and it needs a caring President to heal the differences between the government and the people. We must have confidence on ourselves and our country. Dr Tony Tan’s confidence for the future is different from us. His future is a pair of old spectacles. We need a future with new changes. The PAP government is running the country now and will continuing to do so until the next general election which will not only take place 5 years later. There should be no fear and worry to vote for a candidate other than Dr Tony Tan. Voting is compulsory and secret. Speaking on the eve of Nomination Day, PM Lee stressed that it is important for Singapore to have a good President, and for the President to work closely with the government. He added that his government will work with the man chosen by voters, whoever he is. So, if you think Tan Jee Say is a good President, then you should vote for him. The definition of good President is defined by you, the voters, not the government. The government must respect the choice of the people and work closely with the President. The Presidential Elections Committee, in assessing the suitability of each hopeful, was satisfied that Mr Tan Kin Lian, Dr Tony Tan, Dr Tan Cheng Bock and Mr Tan Jee Say are all men of integrity, good character and reputation. All candidates have integrity, good character and reputation. You have a choice not to veto for Dr Tony Tan. What we do need now is a President different from the past. We need a President with a heart to voice out the concerns of the people. He has to be different from the PAP government otherwise there will have group thinking from top to bottom. The Aljunied incident is another case that people’s voice and choice are not respected by the government and if we continue to elect Dr Tony Tan as President, then the situation will not change, the PAP will continue to use their government machinery (HDB, PA, etc) to bully the people. Speaking to reporters before his Meet the People Session yesterday, a visibly worked-up Mr Low Thia Khiang said: "The way I look at it is ... it seems to me to be the case that some Residents' Committees behave like the king in their own kingdom ... They expect to be treated (with) priority." The President as an independent mind and non-political person can remind the government to be neutral on this matter. Throughout the campaign, there are several rumours regarding to Dr. Tony Tan’s family. Even all his three sons issued statement to clarify the matter, the voters still have doubt. Dr Tony Tan should sue whoever spreads the rumours and not just felt that ‘he was 'deeply disappointed' by these online allegations. Disappointment will not kill the allegations. Dr Tony Tan is close to the PAP and he is not Ong Teng Cheong. In all his interviews, discussions and talks, he wants to continue to be a pro-PAP President. If you like it this way, then you vote for him. Otherwise, look for a heart, or a high-5. A divided Singapore urgently needs a caring President with a heart and voice out their concerns. Does Dr Tony Tan really have the economic and finance brain for the coming crisis? When the West is looking for China and India for solutions for their economic and financial problems, does Tony Tan have any knowledge about these two countries? All we know about is his unimpressive performance at the GIC. For the past 30 years, Dr Tony Tan is associated with the economic success (as well as the setback) of Singapore. We are one of the most successful models for capitalism in the world, even the west is very envy of us. Our latest attempt to boost our economy is still a continuation of western model and will result to even bigger gap between rich and poor. The West now acknowledges the shortfall of their economic strategies and options of the past and is looking for new solutions, including inputs from the East and Latin America. New model for Singapore but can he contributes? In his speech at SMU Dr Tony Tan recognised that Singapore has reached a level that we need to seek new model and route for our economy. However, his western trained knowledge in finance and economic may not be suitable for future Singapore. Instead, it could be an obstacle and provides wrong advices just like what he did in the GIC. He said he was an experienced hand in the financial world and claimed that he would be the best candidate to handle an economic storm. He is going to speak at the lunch rally on economic situation and jobs. Again, from the western perspective, I think and I believe. Do we still need an outdated western model to solve today’s economic problems? And even you want to go back to the fundamental, for Dr Tony Tan, his fundamental is his western education. No wonder he only knows how to invest in the USA, however, even his US investments do not generate good income for Singapore reserve. So when the wave is moving to the East, how can Dr Tony Tan help Singapore to benefit from the wind change? If the government takes his advice and the reserve will 输得更惨 (loses even more money). Dr Tony Tan’s strength in economic and finance after all is not a great deal and Singapore will not benefit for having him as President. Furthermore, he is only professionally trained in physics and mathematics. A western trained economist with the understanding of the East can give and provide better solutions to Singapore, not Dr Tony Tan if we really need one. However, within Singapore, we need to look for a caring President. It is better for voters to put on a pair of glasses to look for a heart – a missing heart hiding some ways in the past 50 years. In this Presidential Election, we are selecting a candidate to safe guard our reserve. However, our reserves are all in numbers, for example investments in shares, stocks and gold etc. Our CPF money is also the same, in numbers of units of Singapore Government Securities. To transfer these money assets is very easy; you just need to key in the password and the correct codes. We don’t know the magic numbers in our reserve. We certainly don’t know how they transfer the money assets. But if it is in the case like the one happened in Aljunied, then we will have to worry about it and ask for greater transparency. In a media statement yesterday, WP chairman Sylvia Lim argued that HDB - "as part of the Government machinery" - is abusing its power as land owner of common property in HDB estates to help the PA achieve the political objectives. The transfer of lease ONLY takes effective after WP won Aljunied GRC. If PAP remains in Aljunied, will HDB do the transfer? This is against the wishes of the Aljunied voters. It is a step back ward in our democratic system. Do you believe the PAP government is listening to the people? If a non-PAP endorsed candidate wins the Presidency, can you imagine what kind of transfer will the government do to our reserve? But if we don’t elect this candidate, we never know the true picture or half true picture. Therefore, voting a candidate like Tan Jee Say, we will see how the government transfer the money assets in the reserve even Tan Jee Say may not be able to veto it under the Constitution. At least, we can see the movements and the transfer of money assets. Tan Jee Say will report to the people how the government transfer the reserve from one pocket to another pocket. 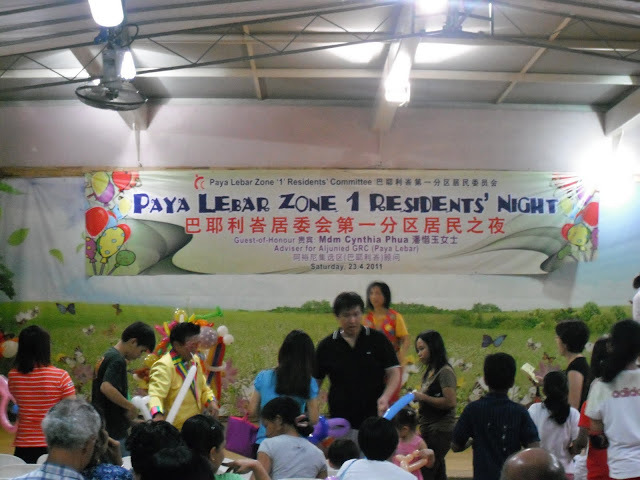 This is really beyond the issue of ‘Chen Show Mao barred from events in Paya Lebar’. It clearly shows that elected MPs of the other side will not be treated equally. This will apply to the Elected President of the other side. He will be treated differently. Voters who vote for Tan Jee Say will have to be prepared that he will be treated differently from the government. But at least, the trade off is we will see some transparencies in our reserve. If you vote for Tony Tan, you can never expect him to give you the transparency. He is happy to remain the status quo. There is a price to pay for voting Tan Jee Say. But if you want transparency, you will have to vote for Tan Jee Say. If the government treats some MPs and even the President as second class, do you think the government will treat the citizens as first class? Now it is time for change. We want to be the first class citizens in this first world country called Singapore. The Unknown Unknowns of Dr Tony Tan?